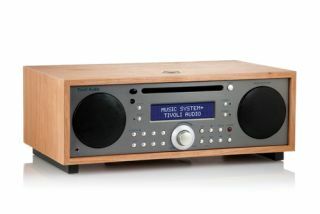 Tivoli Audio launches Albergo+ and Music System+ radio systems | What Hi-Fi? Tivoli Audio has announced the launch of the Music System+ (above), its all-in-one audio system that replaces the original Music System. Packed with the latest technology, including A2DP Bluetooth for high-quality wireless music playback, the Music System+ brings over a raft of features from its predecessor while maintaining the system's simplistic user interface. Also new is the Tivoli Albergo+ (below), also a Bluetooth-equipped DAB, DAB+, AM and FM radio, yours for £199 and available to buy direct from John Lewis, amongst other retailers. The Music System+ is made from a hand-oiled, furniture grade wood cabinet, and houses integrated stereo drivers, separate amplifiers and an adjustable downward-firing subwoofer. Boosting the sound quality is the company's SpacePhase Wide Mode which Tivoli claims produces "an expansive soundstage that envelopes you in sound". The Music System+ rather lengthy feature list also includes an integrated slot-loading CD player that's compatible with MP3, WMA and CD-R/CD-RW formats, DAB/DAB+ functionality, dual independent alarms and a digital clock with battery back-up amongst other features. The Tivoli Audio Music System+ comes in several wood-panelled finishes and is on sale now for £699. The Albergo+ meanwhile was initially built with the hotel sector in mind (Albergo is Italian for hotel), and so has a range of bedside clock radio features – alarms, sleep and snooze functions – as well as wireless Bluetooth streaming, but no CD player. A mono speaker design, the option to add a separate stereo speaker is set to be made available later this year. There's a choice of anthracite and white finishes, and the Albergo+ is a far more affordable £199 and on sale now.